You can edit these links in Site Actions > Site Settings > Top link Bar. Also, you can no longer rename the Home Page link from this menu (it disappears when you put it into edit mode). 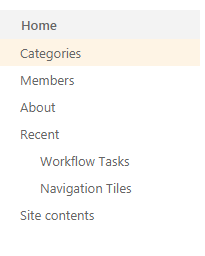 To change it you’ll have to go to Site Actions > Site Settings > Title, Description and Icon. Once you change the Title of the site here it will automatically take effect in the top navigation. Read more here. Not the answer you're looking for? Browse other questions tagged url discussion-board or ask your own question.